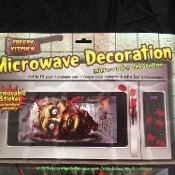 The gory bloody head sitting in the microwave will be an unexpected surprise for everyone! Halloween Microwave Door Decoration repositionable sticker grabber cling will add a blood-curdling touch to the rest of your horror decor. You could even add our Creepy Crapper Restroom Door Cover, Dishwasher Demon, or Body Parts Refrigerator cover to complete the scene.